When? Tuesday, September 11 – Friday, September 14 (3 nights). I actually think the three nights was plenty – they were very busy days, but we did pretty much everything we wanted to, including a day trip (about 7 hours total) to Nerja. Where? We stayed at the Carmen de la Alcubilla del Caracol hotel in a room with a private terrace (we were in La Torre, which was on the second and highest floor with a commanding view of Granada). The hotel was located a quick 10-15 minute walk away from the Alhambra (pictured above), which was super convenient for us since we visited twice. Our room was 140 euros and breakfast was an additional 8 euros per person, but it was a great breakfast and definitely worth it. Transportation. We walked a lot in Granada. As I mentioned above, our hotel was conveniently located close to the Alhambra, so there was no need to take public transportation up to the entrance. Also, the main area of Granada (near the cathedral and Royal Chapel) was a downhill walk from the hotel and was not too steep to walk up. We did use the bus for two trips: the minibus to the caves of Sacromonte and the Alsa bus on our trip to Nerja. Food. We had some fantastic food in Granada, including a few free tapas! Our last night in Granada we went to Calle Navas, which is just off of Plaza del Carmen (and close to the Cathedral and not far from Plaza Nueva – really, everything in that area is very walkable). 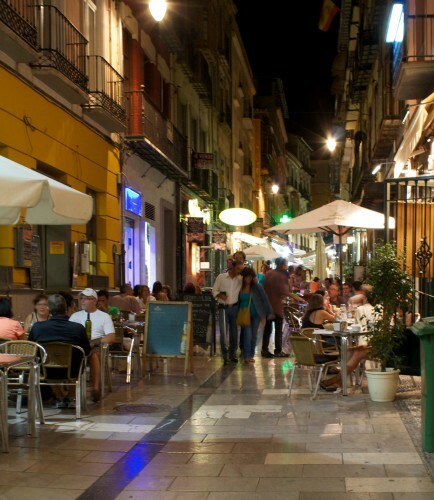 There were so many tapas bars concentrated on this one street, and it was bustling until late in the night. We had a mix of tapas – marinated tomatoes, jámon iberico, fried baby squid, and grilled cuttlefish, and they were all delicious! We were especially impressed with the flavor and freshness of the tomatoes and the lemony cuttlefish grilled to perfection. Calle Nueva was also a great place for people watching. I just wish we had tried out the area before our last night! Day Trips. We took a partial day trip to Nerja, on the southern coast of Spain. We rode the Alsa bus both ways, which took around 2 hours and was comfortable (our bus on the way there even had wifi!). Attractions. There were so many things to do in Granada. 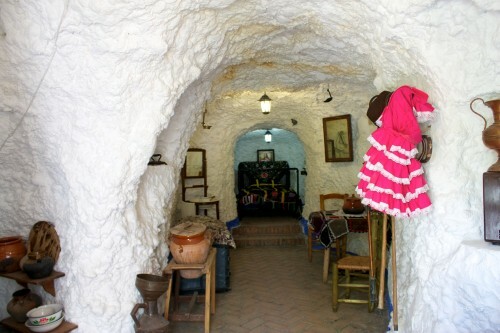 The best site was definitely the Alhambra, which I’ll talk about in more detail later, but we also enjoyed other sites like the San Nicolás Viewpoint (with a great view of the Alhambra) and the Cave Museum of Sacromonte (pictured below). The caves took a bit of time to get to (including a hike up a steep hill), but it was really interesting to see the caves set up as if they were currently being used as houses, kitchens, stables, and rooms to make crafts. We also decided to relax a bit and tried out the Arab Baths at Hammam Al Ándalus. For 23 euros each, we had 90 minutes to relax in the warm pool, hot pool, cold pool, and steam room. Only 30 people are allowed during each time slot (every 2 hours, 10:00-24:00), so it’s not super crowded. It was nice to get out of the heat of the day and do something we normally wouldn’t do. There is also a location in Sevilla! Language Barrier. Similar to Sevilla – I was able to use some Spanish when I could, but everyone spoke English very well. Cost. Aside from our first lunch in Granada (after checking in it was almost 16:00, so we had limited options and went to the fancy restaurant nearby), our food was very reasonable. Advice. Book ahead for the Alhambra! I will be writing more detailed posts about our two visits, but I would highly suggest a night visit for less crowds and a more magical experience. We also enjoyed our day trip (we had a lot more time), but it would have been too hot and too crowded had we not chosen one of the first few time slots. Closing comments. Andalucía is a beautiful part of Spain and should not be missed! We absolutely loved Granada and Sevilla and would love to visit the area again. Even though Granada is a large city, it felt personal and very cultural. This entry was posted in City Overview, Travel and tagged Granada, Portugal/Spain 2012 Trip, Spain by Kristin. Bookmark the permalink.